Tonight: Mostly cloudy. Passing sprinkle. Mid 30s. 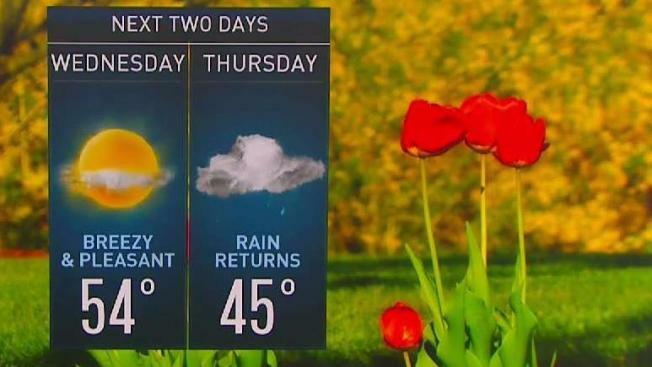 Tomorrow: Sun & clouds. Low to mid 50s. Thursday: Rain returns. Cool, windy & raw. Low to mid 40s. Yesterday’s rainy, windy, and chilly Boston Marathon proved to be one of the most challenging for runners in recent years. Possibly the most similar in terms of weather would be the Boston Marathon in 2007 that had reports of snow on the ground at the starting line, gusty winds at 20 to 30 mph (sound familiar), and temperatures into the mid-40s along with rain. The starting line in Hopkinton received over 2.30 inches while the finish line in Boston reached 1.57 inches of rainfall. The system that brought the brutal conditions for the annual 26.2-mile race, is continuing to spin over northern New England, shifting the wind direction for southern New England to out of the west-southwest. It’s a drier start for most of New England, besides some lingering showers and dense fog for northern Maine and northern Vermont. Over the course of the day today, we can expect quite a few locations along the immediate coastline to stretch into the low to mid-50s, with the interior remaining in the 40s with the wind direction out of the west-southwest at 10-15 mph. It’s a mostly cloudy start, with an occasional peek of sunshine, but a few more showers will pop up this afternoon, likely around the evening commute. However, this rainfall will not be nearly as heavy or as widespread as yesterday. Tonight, we’ll see a partial clearing of the skies, as any lingering showers move out, and temperatures slip into the 30s across New England. For the interior and higher elevations, black ice is a possibility as temperatures will hover around the freezing mark, so be mindful of that before you depart for that Wednesday early morning commute. At least the rest of Wednesday is looking seasonable and pleasant with highs into the mid to upper 50s under a mix of sun and clouds. Enjoy Wednesday’s weather while it lasts since another system slides in Thursday into Friday bringing some more April showers, that could change to flurries for the higher elevations late Thursday into early Friday morning. Highs on Thursday and Friday will likely struggle to make it out of the 40s. However, when we have a system during the late work week, that usually departs by the weekend, and lucky for us, this weekend is looking beautiful. Saturday and Sunday will produce plentiful sunshine and highs into the mid to upper 50s. By next week, a seabreeze will keep temperatures into the 50s at the coast, but 60s will start popping up for those away from the coastline.